​I have used Atlas products for a few years now and I am a firm believer that their equipment saved me from some serious injuries. The sport of Motocross is no doubt one of the most dangerous sports in the world. ​The speeds, the obstacles, physical dynamics, etc., all play a critical role in what makes this sport one of the most dangerous and the most EXCITING. Along with it, sometimes come injuries. It is inevitable that at some point you are going to crash while riding, no matter what your skill level is. The better protected you are, the less likely you are to sustain a serious injury. At least in theory. ​Still, injuries happen. The best thing you can do is protect yourself using the most technologically advanced equipment. We Get Faster, We Wear Less. I'm not quite sure why this is, but it seems like when people start out in the sport of motocross, they are wearing so much gear, they look like an armadillo mascot for some college in Texas. Ironically as we become better, faster riders, we tend to start shedding the gear and wear less and less, trading safety for comfort. This seems to be kind of a backwards mentality, but it is the norm in this sport. The thing is, you don't have to trade safety for comfort at all. You just have to chose the right equipment. There are other companies out there that produce neck braces, but I found that Atlas lead the pack in a few areas. Comfort & Design: The Atlas brace is very comfortable and lightweight. The rear of the brace has two pads that sit on either side of the spine and they will move independently from each other. The front of the brace has the same type of technology, with two different pads that sit on your chest (Pec muscles) and disperse energy in the event of impact. The brace sits on top of the trapezius muscles and arches over the collarbone. The overall design of the Atlas Brace keeps pressure off your sternum, spine, and collarbones and puts impact energy on larger muscles of the body. Here's Ryan Villopoto and his thoughts on Atlas. As I mentioned, I have had my own experiences with the Atlas Brace, and in both instances, I am thoroughly convinced that this neck brace saved me from some serious injuries. The first crash I had (see the video below), I cartwheeled and my head and neck took a serious impact. After all was said and done, I suffered a concussion and a sore neck. I had to replace my neck brace because the plastic structure material of the neck brace was actually twisted and deformed. I can only imagine what it would have been like if I wasn't wearing the brace. 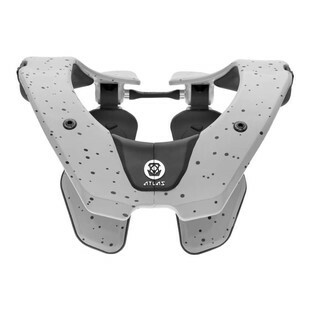 Atlas Air Neck Brace Light, flexible and showcasing a sleek yet sophisticated design the Atlas Air Neck Brace offers the perfect combination of style and function. The overall height of the brace has been reduced over previous models, while the surface area in contact with the body has been increased to maximize the distribution of impact forces. ​A smaller and lighter brace feels less restrictive and greatly enhances the user experience. ​Features: Split-Flex frame helps mimic natural body movements to create the best experience possible Easy open system allows for quick, repeatable entry and exit with a simple push of a button. ​​One mount, six positions, reversible to adjust size and choose from a -10, 0, or +10 back support angle in either position. Long travel front chest suspension features 30mm of travel and is slightly stiffer than previous models to help dampen a wider range of impacts. Choose from two possible height adjustments to create the best fit for your body type and helmet choice. Back supports increase contact with the body by 8 over previous models and avoid the spine by sitting on the surrounding muscles Chest support design is stronger, lighter and more compatible with chest protectors. Hybrid strap combines the comfort of a chest strap with the function and versatility of elastic X straps. ​Note: Chest circumference is measured high on the chest, right below the arms.